Life in Mumbai and the rest of Maharashtra came to a standstill as torrential rains killed over 100 people across the Konkan belt and Thane districts and stopped rail and air traffic. With the Met department forecasting heavy rains for the next 48 hours, the state government has sounded a red alert and advised people to limit their travel arrangements for the next two days. Maharashtra Chief Minister Vilasrao Deshmukh said a 24-hour disaster mitigation centre had been set up in the Mantralaya that would co-ordinate relief and rescue operations. All schools will remain closed for two days. The Mumbai domestic airport has been shut down and the authorities said a decision on reopening it would be taken only tomorrow. Today's last flight landed at 2.14 in the afternoon. According to Sudhir Kumar, Director, Airports Authority of India, flights have been cancelled due to poor visibility. "I am waiting at the Delhi airport to go to Mumbai," Saroj Dutta, Executive Director, Jet Airways, told Business Standard in the evening. Indian Airlines had to divert two of its flights to Ahmedabad coming from Mangalore and Delhi and one flight from Calicut-Coimbatore and a Goa flight to Goa. The status of Jet Airways was no better. Most of its flights had to be cancelled. Anyone wants to blame this on Shiv Sena? BJP? No .. just asking ..
Well, Mumbai city has always been flooding during rains. padhu will vouch that Kings Circle and Sion Hospital road near our school used to flood and it meant a holiday for us kids! Its sad that we had such a loss of life. I hope that as India talks of going to 21st century and becoming a developed nation within the next few years, we do somehting about drain water disbursal and such stormy rains. saw this in the news yesterday. amazing how the weather can bring international airports to a close. where are international flights being diverted to, does anyone know? vaat laga di iss barish ne. itne salo main aisi barish nahi dekhi thi. still stuck at my office from yesterday. Hope chiraag, viruss , shivsainik,click and all my friends from mumbai are safe! i pasted one of them. truely..time to think about mumbai infrastructure...seriously. It is 11 in the morning. I am in office :-(. Nothing strange about that. Only thing is I have not been able to leave my building since yesterday morning. It is raining heavily and cant see when it will all end. And the trains have stopped. For mumbai that means death. So I tried going to sleep, playing some games... what else nothing. Suddenly I feel so empty. Looking at the window .. the clouds not finishing their quota, the cars on the road moving 5 metres / hour, People who havent walked across their streets are today hopping out of cars and willing to trot / wade for 10 kms to reach home. I cant do that I work 35 kms away from home. I cant call home yuck phones jammed. Mobiles are unreachable. The cable operator is unreachable too. But the only solace is I still have the internet. India Shining eh? i am safe at my office. internet bhi abhi chalu hua hai. fones r jammed. kal se ghar jaane ki try kar raha hu. lekin abhi tak yahi atak gaya hoo. aaj bhi ghar jaane ke chances kam hai. Lots of rains in Pune too, but things are oks, Iam able to commute to office though the traffic and roads are pretty bad. any chances of Mumbai getting better by tomorrow, have to go to Mumbai for some work? Will cancel visit tomorrow. Thanks. chapai, spoke to family last night and not just king circle but mumbai ki vaat lag gayi hai. I was seeing some pics on mid-day and its amazing that places like mahim causeway and bandra carter road are flooded. These areas were never flooded before. Guess this 30 yr record of highest rainfall is a killer. I hope all family members of all our friends here are safe in maharashtra as a lot of people are dying in small villages in maharastra. I really felt sad for some folks in Raigad district who were making Ganpati idols for the last 9 months and that is their only source of income and all those idols were swept away and destroyed. Mother nature sure shows her true colors at time. As of this morning, all flights are being terminated at New Delhi. No flights are moving ahead to Mumbai. A lot of direct international flights to mumbai have been cancelled. Sahar airport is still down becuase the ILS systems are submerged. I have never seen in mumbai even during heavy downpours that an international airport close down. This rainfall sure beats the crap out of everything. folkz, please post any updates bout Bombay International ariport as and when available..thanx..
BOMBAY (Reuters) - The Bharat Petroleum Corp. Ltd. (BPCL) and Hindustan Petroleum Corp. Ltd. (HPCL) have shut some units of their Bombay refineries after heavy rains caused flooding across the city, company officials said on Wednesday. State-run BPCL said one crude distillation unit (CDU) had been shut down but it was expected to resume normal operations by Thursday. "One of our two crude distillation units (CDU) has been shut as a precaution. But it is in circulation and will resume full production tonight or latest by tomorrow," he said. BPCL Chairman Ashok Sinha said a third of the refinery's output had been affected. The refinery had been processing about 180,000 barrels per day before rains and high tide flooded vast areas in India's commercial capital on the country's west coast. The refinery is being upgraded to process 240,000 bpd. Officials at state-run HPCL said rains had hit output at both its CDUs, but they did not say to what extent output had been affected, or when normal operations would resume. "All the units, including the crude distillation units in the refinery, have been affected due to unprecedented rains," said D.K. Deshpande, HPCL's executive director for refineries. HPCL operates a 110,000 bpd refinery which has several units, including two CDUs, two vacuum distillation units and a fluidised catalytic cracking unit. HPCL officials said both CDUs of its Bombay refinery were "under cold oil circulation", which enables the company to resume normal operations quickly if the situation improves or to shut it down completely in case of an emergency. The company's director of refineries, M.A. Tankiwala, said a technical team was conducting safety checks to resume normal operations when the floods recede. Officials at India's largest oil exploration firm, Oil and Natural Gas Corp., said output from its Bombay High fields in the Arabian Sea off the coast of Bombay was normal. A major fire broke out at one of the oil platforms in Mumbai High oilfields of Oil and Natural Gas Corporation (ONGC), officials today said. 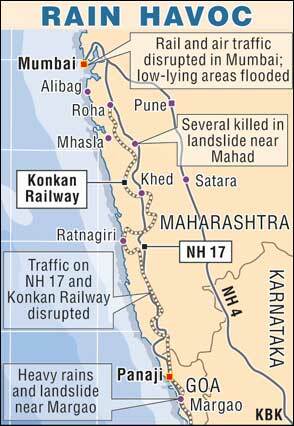 The cause of the fire at the platform, located some 160-km from the Mumbai coast, was not immediately not known. "We had a major accident... we don't have details as of now... we are assessing the damage," ONGC chairman and managing director Subir Raha told PTI here. It wasn't clear if there was any loss of life, but production was certain to be affected. The Mumbai High North platform, which caught fire, was used to collect oil from the northern part of the field and process between 60 to 70 barrels per day.